Amazing climb of New Zealand's highest mountain Aoraki/Mt Cook (3754 m). Day 1: Five km of hot moraine bashing up the Tasman Glacier brought us to a lovely bivvy site below the Freshfield Glacier. Day 2: Early morning start (4.30 am) to gain the Grand Plateau via Freshfield Glacier. We climbed Glacier Dome before descending to Plateau Hut, which we reached at 9 am. Day 3: Midnight start across the Grand Plateau and up the Linda Glacier. We picked up Jaz on the way, who had camped with Mike below Bowie Ridge. The three of us then quickly climbed through fresh debris from the Gun Barrels, crossed the Linda Shelf including an interersting schrund and started climbing the summit rocks just on sunrise. We reached the summit ice cap at 7 am and shortly after belayed one at the time across to the climber's summit, which we reached around 8.30 am. We then abseiled down the summit rocks, picked up Mike at camp and descended the Linda glacier crossing now unstable snow bridges and reached Plateau Hut at 3.30 pm. 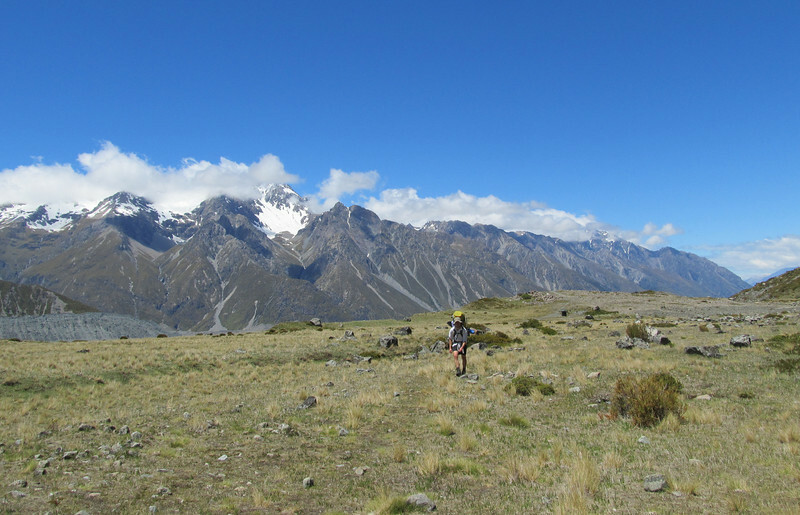 Day 4: Another early morning start (6 am) saw us leaving Plateau Hut in gale force NW winds to cross Cinerama and Boys Cols and descend to the Tasman Glacier. Active seracs and steep moraine walls added some excitement to this route. Team: James Thornton and Nina Dickerhof (Mike Cook and Jaz Morris in parts). Ball Terrace - the start to any good trip to the Tasman Valley.